When I was at Art College, we were set a year-long-project in which our task was to trace the whole of Art History through a single topic. We were to collect images from all eras of the history of Western Art relating to a single theme, and to then organise these into a timeline. The hope was that we would understand how different trends had developed throughout the history of Western culture by choosing something which we were interested in as our starting point. 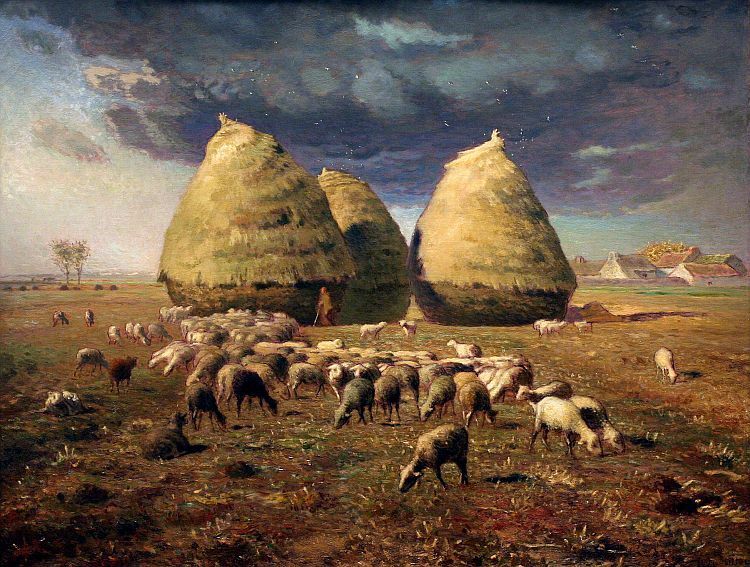 Although Millet is very famous for his figurative paintings depicting the lives of French peasants, it will come to you as no surprise that my favourite paintings of his involve sheep and the activities of Shepherds and Shepherdesses. These paintings seem quaint and old-fashioned to modern eyes, but at the time in which they were painted, they radically challenged the established ideas about what could be considered ‘beautiful‘. Millet’s paintings made a strong, articulate case for the world to reconsider what was and wasn’t worthy subject matter for ART, turning his eyes away from the established visual fare (models draped in silk and dancing cherubs,etc.) to document everyday life in rural France. Millet saw no value in dolling reality up and said “Let no one think that they can force me to prettify my types… I would rather do nothing than express myself feebly.” Prettiness he may have eschewed, but it seems to me (and my admittedly very limited experience of farming) that Millet nonetheless carved out an expressive and beautiful language for telling it like it is when it comes to farming life. I remembered all this when Diane – whom we heard from earlier in Wovember – sent me the link for this post, and offered to let us republish it here. 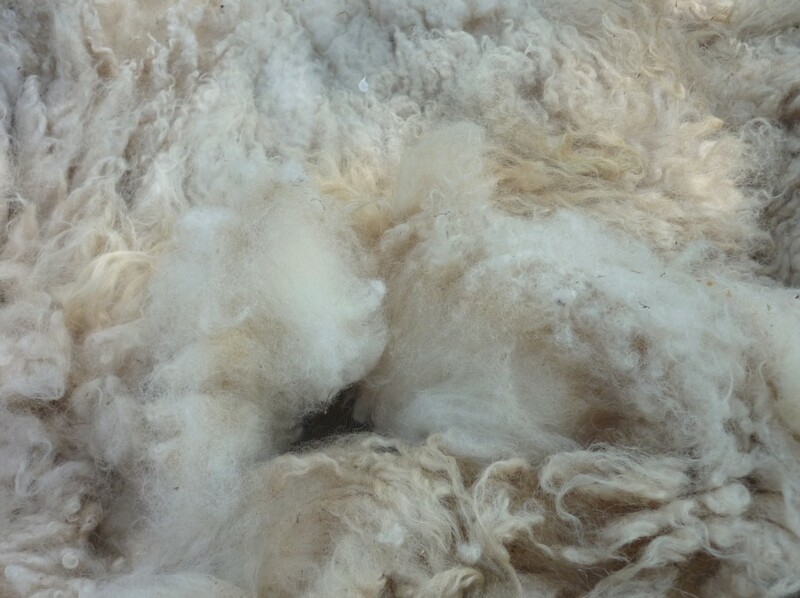 Thinking of Millet, I began to fancy that his important ideas live on in some small way here through the many photographs which you all have sent in, and in the stories that we have heard throughout Wovember on this blog regarding wool, labour, industry etc. I feel all projects which search for meaning in the everyday (for instance the everyday meaning of clothes or sounds) are indebted in some way to Millet and the founders of the Realism movement. 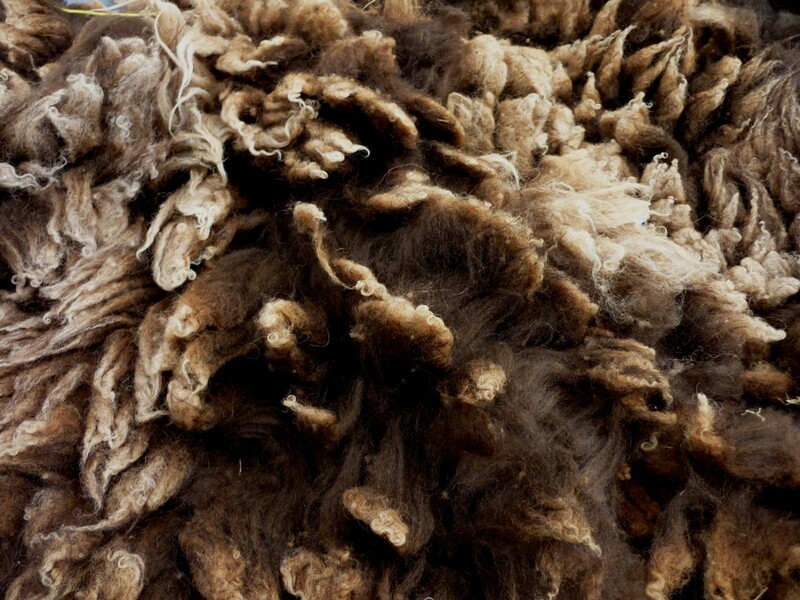 I like to think that – were he alive today – Millet would find this site a worthy testament to the animals and landscapes and workers from whom woollen clothes ultimately come. And I like to think that Millet would have eschewed the misuse of the word WOOL by the fashion industry and called it a “feeble” and “prettifying” approach to the truth. So here is Diane, talking – as a contemporary shepherdess – about her own relationship with Millet’s picture, “Tondeuse de Moutons” or “Sheep Shearer.” In the spirit of Tom’s wonderful post on the relationships between Dutch and English words for sheep and wool, I have left this post as Diane originally published it – in both French and English – because I am sure there are many words in both languages relating to sheep and wool which hold important ideas that cannot be completely translated. Since the dawn of time, a very important bond has existed between sheep and man. Sheep were one of the very first animals domesticated by man, providing a source of meat, milk, and of course wool. Additionally, the importance of this special bond between sheep and humans is seen in the many sheep metaphors that can be found in literature, religion, and politics. Think about the 23rd Psalm (“The Lord is my shepherd …”), Panurge’s sheep in the writings of Rabelais, and of course black sheep in the world of politics. Depuis l’aube de la civilisation, il existe un lien très profond entre l’homme et le mouton. Un des premiers animaux domestiqués par l’homme, le mouton sert comme source de viande, de lait, et bien sûr de laine. D’autres part, l’importance de ce lien particulier entre ovins et humains est mise en évidence à travers de nombreuses métaphores ovines qui se retrouvent dans la littérature, la religion, et la politique. Pensons, par exemple, au 23ème psaume de David (“Le Seigneur est mon berger …”), aux fameux moutons de Panurge chez Rabelais, et aux moutons noirs de la politique. To a certain extent, the bond between man and sheep is even closer when it’s a question of the link between women and sheep. It is often the shepherdess who watches over the flock. Moreover, for centuries, it’s been women who have been in charge of spinning wool into yarn, either with a spinning wheel or a hand spindle. D’une certaine façon, cette relation ovine-humaine est encore plus étroite quand il s’agit du lien entre la femme et le mouton. C’est très souvent la bergère qui surveille le troupeau. Surtout, depuis des siècles, c’est la femme qui est chargée de transformer la laine en la filant, soit au rouet, soit au fuseau. Jean-François Millet (1814-1875), a French painter from Normandy, is well-known for his painting “The Gleaners”. 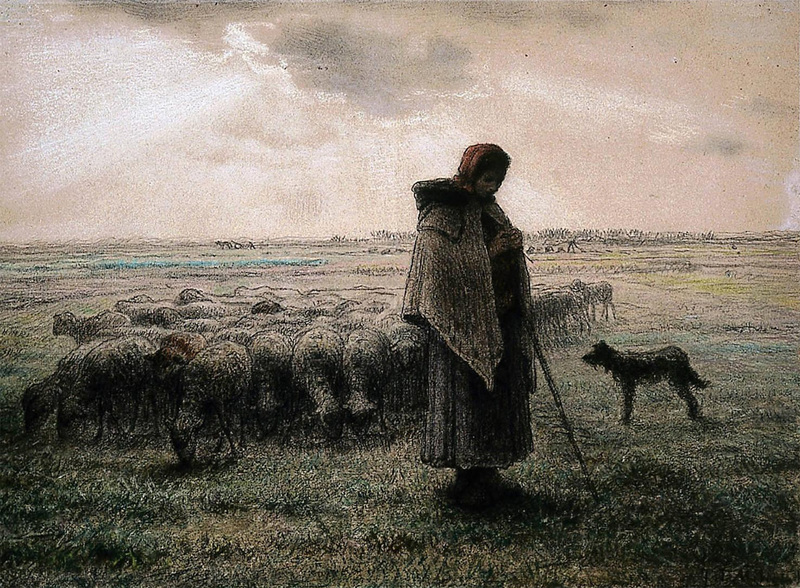 Millet’s paintings depict scenes from rural French life and a number of his paintings testify to the special bond between women and sheep : for example, “The Shepherdess with her flock” and “The Spinner”. 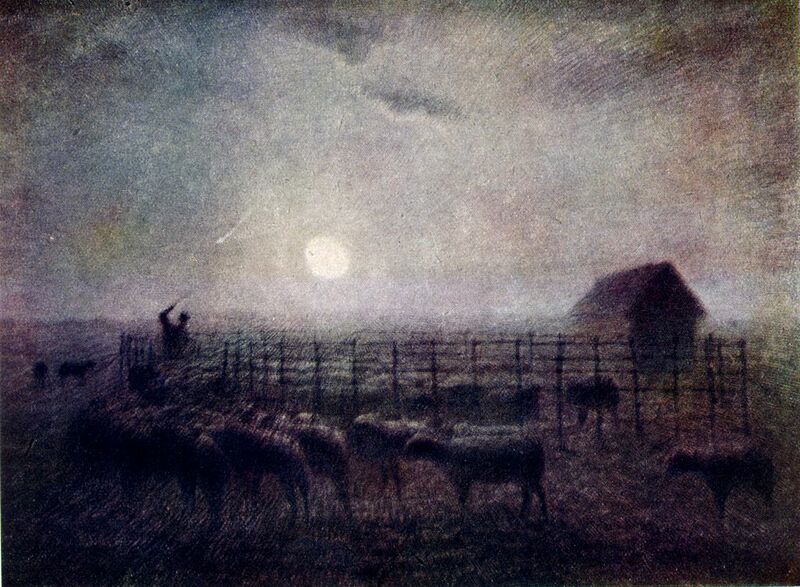 Jean-François MILLET (1814-1875), peintre normand, est surtout connu pour son tableau, “Des glaneuses”. 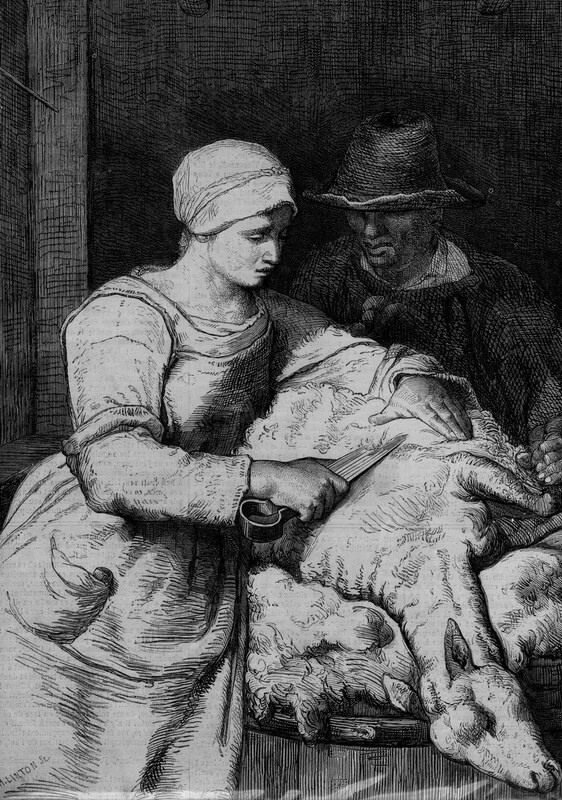 La vie paysanne s’avère le sujet favoris de Millet et à travers plusieurs de ses tableaux, il témoigne de ce lien privilégié entre la femme et le mouton : par exemple, “Bergère avec son troupeau” et “La fileuse”. As shearing time is just around the corner, I would like to share with you an engraving of one of Millet’s paintings entitled “Sheep Shearer” which was published in 1862 in Le Monde Illustré. Aujourd’hui, comme le moment de la tonte s’approche, j’aimerais bien vous proposer une gravure du tableau de Millet intitulé “Tondeuse de Moutons” qui a été publié en 1862 dans Le Monde Illustré. I really like this picture. To be quite honest, I have always thought about shearing as a “man’s job”. Nonetheless, as Millet shows, it’s in fact the woman who is holding the shears! Je trouve ce tableau très sympathique. Pour être honnête, j’ai toujours considéré la tonte plutôt comme domaine de l’homme. Pourtant, comme le montre Millet, c’est bien la femme qui tient les forces. I have just started shearing. What a beautiful reward for a spinning shepherd! Chez moi, la tonte est commencée. Quelle belle récompense pour une bergère-filandière! 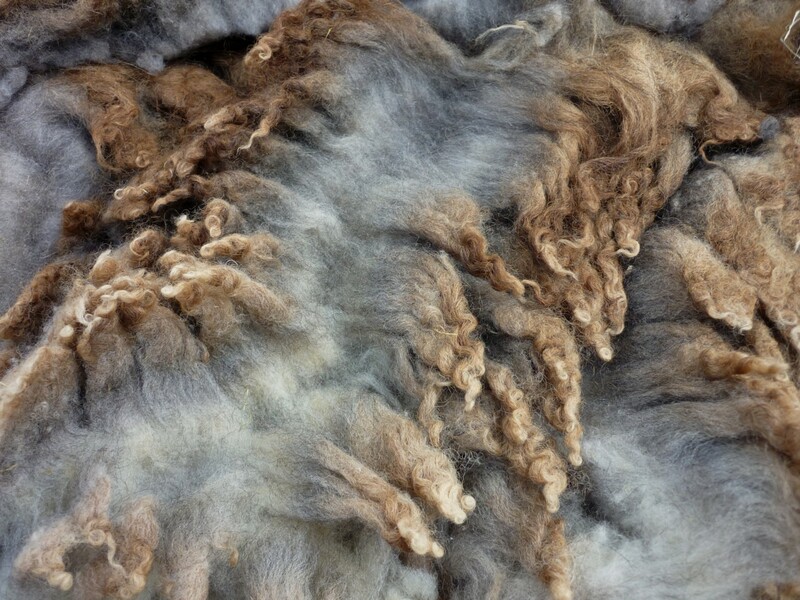 …I thought we should end WOVEMBER with some nice fleeces. But if you are missing your sheepy fix, check back over coming days to see our gallery and the entries as they are published. Thank you everyone… we hope you have had a Wonderful, Woolly Wovember!